Scientists studying plant cell walls—structural supports that help plants overcome the downward pull of gravity—have discovered mechanistic details of a protein involved in the assembly of lignin, a key cell-wall component. The protein acts as a targeted "electron shuttle," delivering the "fuel" that drives the construction of one specific type of lignin building block. 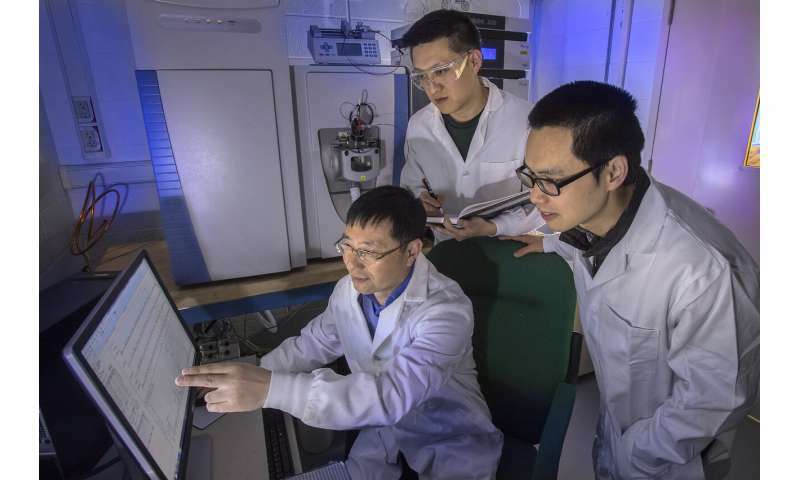 The study, published in The Plant Cell on April 8, 2019, by scientists from the U.S. Department of Energy's Brookhaven National Laboratory and their collaborators, revealed that this particular electron shuttle was different from those that drive the production of other kinds of lignin precursors, said Chang-Jun Liu, the Brookhaven Lab biochemist who led the research. These findings suggest that controlling the relative abundance of electron shuttle proteins could be a new strategy for steering which cell-wall building blocks are put in place as plants grow. Traditionally, scientists have sought to control the mix of lignin and other cell-wall building blocks by focusing on the allocation of carbon, the essential backbone of all these molecules. The idea is to drive carbon into molecules that would be useful for specific applications. For example, a certain mix of lignin building blocks could make cell walls easier to break down to increase the efficiency of converting biomass to biofuels. An abundance of one particular lignin polymer, on the other hand, could be used for making carbon fibers or high-value aromatic compounds for flavors and fragrances. "Much of this previous work has directly targeted the enzymes that steer carbon into different biochemical pathways," said Brookhaven's Liu, who also holds an adjunct position at Stony Brook University. The new work suggests an alternative approach, targeting the shuttle proteins that deliver the electrons needed to activate the enzymes. "Electrons are like the fuel for the reaction," Liu explained. "For these enzymes, without this fuel, these reactions cannot happen. By targeting the electron-delivery proteins, we can selectively redirect the electron flow to change plants' lignin composition." The scientists identified the specificity of the electron shuttle protein through detailed studies of the biochemical pathways that lead to the synthesis of three different lignin precursors. They already knew that the synthesis of each lignin subtype—H, G, and S—is controlled by a different oxidative enzyme as part of a single, three-step hydroxylation process. "For all three, the enzyme itself is insufficient for the reaction to go forward," Liu said. Each one needs electrons, delivered by a partner protein. To identify which partners—which electron shuttle proteins—could deliver electrons at each step, the scientists "tagged" each of the enzymes with a different immunological "hook." "We used the three enzymes in the pathway as bait," Liu said. "The tags are markers to which antibodies bind, so you can use antibodies to capture the tagged proteins," he explained. "Proteins associated with each tagged protein come along for the ride. That way we can see which proteins are interacting with each of the three distinct enzymes." In addition to identifying an electron carrier already known to play a role in the lignin synthesis pathways, these "immunoprecipitation-mass spectrometry" studies revealed that a set of previously unidentified partners were also interacting with some of the enzymes. To zero in on the role of these additional protein partners, the scientists used biochemical genetics. 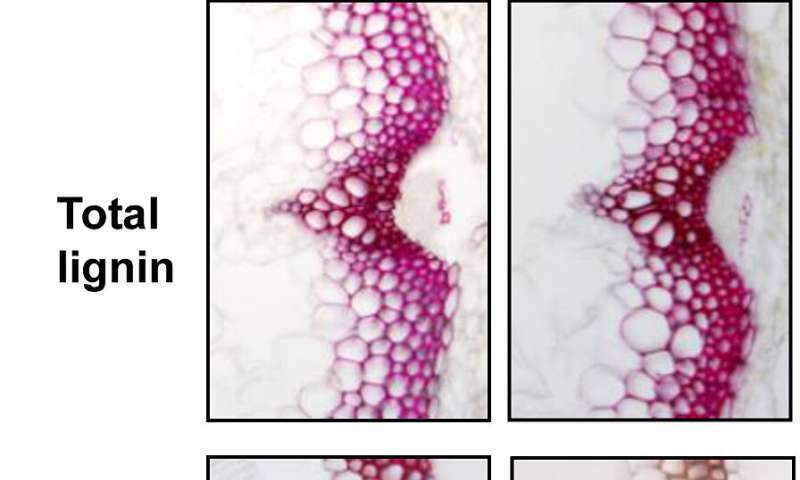 They used strains of experimental Arabidopsis plants that lacked the gene for each particular protein to see what effect the missing genes would have on the total amount of lignin and each type of subcomponent (H, G, and S). They found that deleting the gene for one of these proteins only affects the production of S lignin. They concluded that this "newly identified" electron-shuttle protein must be associated with the last step in the three-step process—the one that produces S lignin. Additional biochemical studies confirmed the conclusion about the exclusive role of this alternate electron shuttle protein in the production of S lignin, and the rationale behind the strategy for targeting the shuttle proteins. "Plants use the sun's energy to convert carbon dioxide into sugars which when broken down release energy that flows into carrier proteins," said Liu. "Specific carrier proteins deliver this energy in the form of electrons into different reactions to drive the whole metabolic process. By controlling the flow of electrons into those various pathways, we can potentially control which products plants make, thereby controlling carbon conversion and storage processes in plants."